Some social situations are more conducive to phubbing than others. Have you ever been around people who spend more time looking at their phone than they do at you? Then you know what it feels like to be “phubbed” – and you’re probably guilty of doing it yourself. Phubbing is the practice of looking at your phone while in the presence of others. And as smartphones become ever more entwined in the everyday lives of Australians, phubbing has become so common that many people think it’s normal. People phub during work meetings, while socialising with friends at cafés, while having dinner with their family, while attending lectures and even while in bed. But how common is phubbing in Australia? And in what social situations is it most prevalent? To find out, we surveyed 385 people and asked them how often they look at their smartphones while having face-to-face conversations with others. They recorded their answers as: never, rarely, sometimes, often, or all the time. We found 62% of those surveyed reported looking at their smartphone while having a face-to-face conversation with another person or persons. Gender made no difference to how often someone phubbed. Neither did geography, with people living in the city and the country phubbing equally as often. But younger people phubbed others more frequently than older people. And people phubbed their partners most of all. The study also revealed smartphone users phubbed their parents and children more frequently than they phubbed their colleagues at work, clients and customers. These findings suggest a professional attitude towards using the smartphone in the workplace. We found people phubbed each other more when commuting together on public transport, during work coffee or lunch breaks, when in bed with their partners, when travelling together in private transport and when socialising with friends. People were less likely to phub others during meetings, during meal times with family, and during lectures and classes. We were interested in finding out whether boredom plays a role in phubbing behaviour so we asked our survey participants to complete an eight-item Boredom Proneness Scale. We found boredom did explain why people phub, but that the influence of boredom is very small. Other factors, such as the “fear of missing out” (FOMO), lack of self-control, and internet addiction may play a more important role in phubbing behaviour. Looking at the smartphone while a person is having a face-to-face conversation with another person is a relatively new phenomenon. While it may violate some people’s expectations, it’s no simple task to categorise the behaviour as good or bad. One theory suggests that when people get phubbed they might judge the behaviour according to how important the phubber is to them. For example, phubbing among friends is probably more acceptable than a subordinate phubbing a manager during a work-related meeting. While that might be good news for the workforce, it’s not great for close relationships. Phubbing partners can make them feel less important and this can decrease the satisfaction with the relationship. In the case of children, especially those at a vulnerable age, phubbing them can make them feel unloved, which can have a detrimental effect on their well-being. Our findings can be used to inform programs, policies and campaigns that aim at addressing the phubbing phenomenon. It’s clear from the research smartphone users are more likely to phub those who are closely related to them than those less close to them. So next time you get phubbed when you are out with someone, take it as a compliment – it could mean they consider you a close friend. The research discussed in this article will be published in the Proceedings of the 2018 International Conference on Information Systems (ICIS). Malcolm Turnbull’s opponents, including those reflexively opposed to Australia’s asylum-seeker policies, would be hard put to take exception to the substance of a leaked conversation with US President Donald Trump soon after January’s presidential inauguration. In an early round of congratulatory phone calls from world leaders Turnbull broached an agreement reached with the previous Obama administration for the US to take 1,250 such refugees in exchange for an Australian undertaking to resettle displaced people from Central America. The latter “understanding” has not been publicised as far as I know, but it was integral to the quid pro quo that enabled an agreement to be reached by the Turnbull government to relocate asylum seekers stranded on Manus Island and Nauru. The incarceration of would-be refugees, economic or otherwise, who have arrived by boat on Australia’s shores is the running sore of Australian politics. The Turnbull government has maintained a steadfast “stop the boats” policy, which was instituted by Turnbull’s predecessor, Tony Abbott, to widespread international condemnation and persistent domestic criticism. The Labor opposition supports such a policy, while seeking to convey the impression it would apply it more humanely. In reality, there is virtually no difference between the two sides of politics. 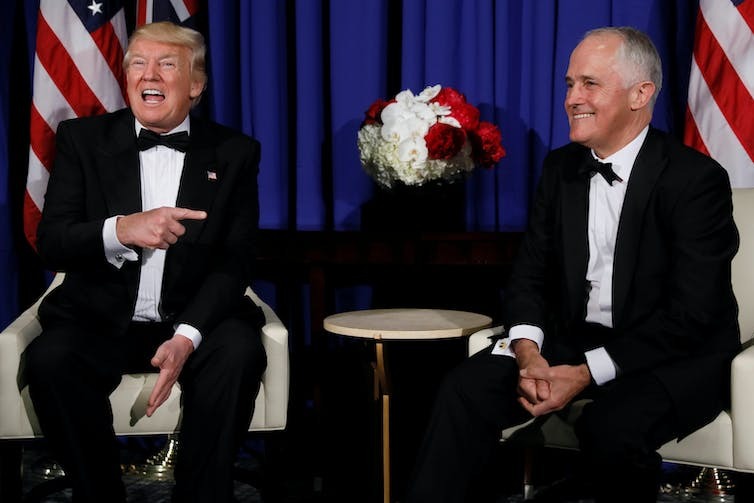 When Washington Post published leaked details of a fractious conversation between Turnbull and Trump earlier this year, an impression given then was that Australia’s prime minister was treated disrespectfully, and indeed had yielded ground to a bombastic president. What the now-leaked full transcript shows is that far from yielding, Turnbull held his ground as he patiently – and courteously – sought to explain the complexities of Australian asylum-seeker policy to a cantankerous president who had himself been elected on a “stop the illegals” platform. A fair judgement is that Turnbull set out Australia’s position in a manner that would not have been out of a place in a barrister’s deposition to an interlocutor who had little clue about the complexities of Australian immigration policy, and seemed to care less. Typifying the dysfunction of a conversation between two men who appeared locked in a cycle of mutual incomprehension are the following extracts. Trump: Does anybody know who these people are? Who are they? Where do they come from? Are they going to become the Boston bomber in five years? Or two years? Who are these people? Turnbull: Let me explain. We know exactly who they are. They have been on Nauru or Manus for over three years and the only reason we cannot let them into Australia is because of our commitment to not allow people to come by boat. Otherwise we would have let them in. If they had arrived by airplane and with a tourist visa then they would be here. Trump: Malcolm, but they arrived on a boat. Turnbull: The only people that we do not take are people who come by boat. Turnbull: The problem with the boats is that you are basically outsourcing your immigration program to people smugglers, and also you get thousands of people drowning at sea. And so the conversation continued like a Beckett play, with Trump venting about the bad deal struck by his predecessor. What emerges from these exchanges is that the US president was either inadequately briefed or had not absorbed what he had been told about a refugee deal leftover from the previous administration. What it also reveals is that once fixated on a point of view, namely that he was talking about the broader problem of unauthorised immigration not the more specific issue of asylum seekers being brought to Australia by people smugglers, it was difficult for Trump to comprehend the distinction. In Trump’s first weeks in office, it may have been unreasonable to expect him to be across these sorts of issues. But the transcript reflects some of the challenges America’s allies face in dealing with an administration whose chief executive knows less than he should about issues that come across his desk, and perhaps more to the point is not a good listener. 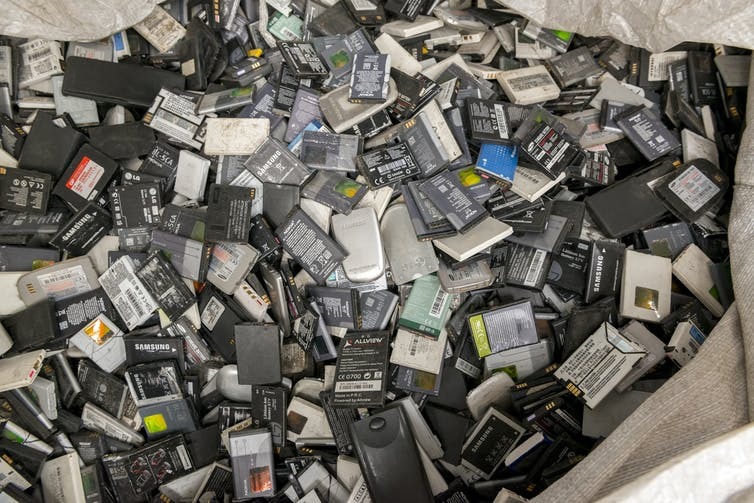 Without proper care, mobile phone batteries can degrade and hold less charge. Read more: Do you know where your batteries come from? Through a few simple steps, users can minimise this degradation and extend their device’s life. 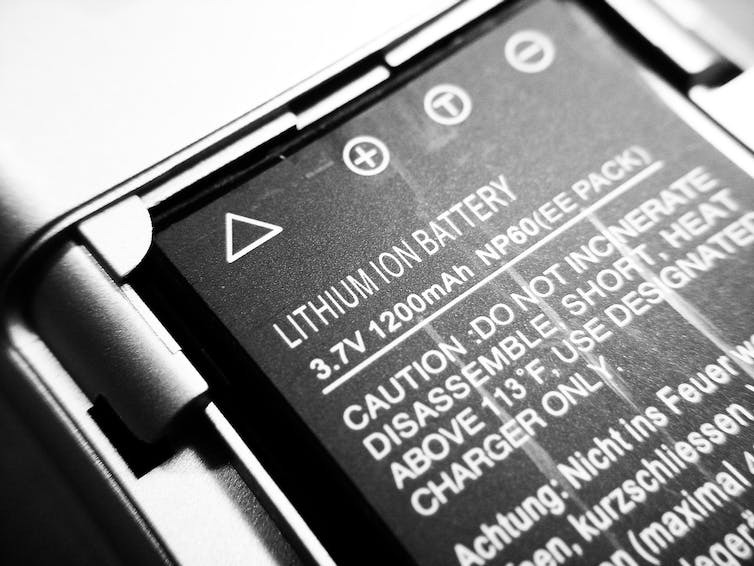 Lithium ion batteries are the main battery type in mobile phones. Typical lithium-ion batteries for mobile phones are supposed to retain 80% of their charge capacity after 300-500 charge/discharge cycles. However, batteries rarely produce this level of performance, with charge storage capacity sometimes reduced to 80% levels within only 100 cycles. Fortunately, we can extend our future battery capacity by limiting how much we discharge our mobile phone batteries. With most battery degradation occurring during deep discharge/charge cycles, it is actually better to limit the battery discharge during any one cycle before charging it again. Nonetheless, to maximise the battery capacity in the future we should avoid that 0% battery mark altogether, while also keeping those batteries at least partially charged if storing them for a prolonged period of time to avoid deep discharge. Many of today’s mobile devices have a fast charge option that enables users to supercharge them in minutes rather than hours. This is convenient when we’re in a rush, but should be avoided otherwise. Physically, the shuttling of lithium metal and lithium ions between the electrodes in lithium-ion batteries is a slow process. Therefore, charging at lower rates allows more complete shuttling to occur, which enhances the battery’s charge capacity. 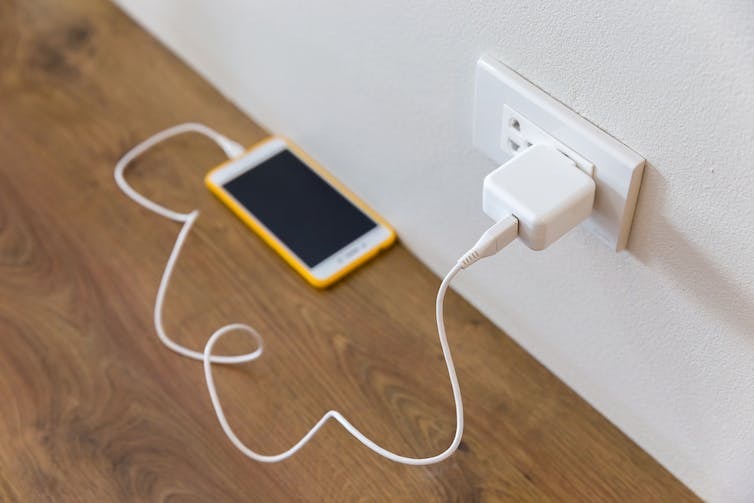 For example, charging a phone in five minutes compared with the standard two hours can reduce the battery capacity for that charge cycle by more than 20%. Fortunately, for most parts of the country, temperatures in Australia sit between 0℃ and 45℃ throughout the year. This is the exact range in which lithium-ion batteries can be stored to maintain optimal long-term charge capacity. Below 0℃, the amount of power available within the battery system is reduced because of a restriction in the movement of lithium metal and lithium ions within the electrodes and through the electrolyte. Above 45℃, the amount of power available is actually enhanced compared with lower temperatures, so you can get a little more “juice” from your battery under hotter conditions. However, at these temperatures the degradation of the battery is also greatly accelerated, so over an extended period of time its ability to store charge will be reduced. As a result, phones should be kept out of direct sunlight for prolonged periods, especially in summer when surface temperatures can increase to above 70℃. Mobile phones only have a limited number of charge cycles before the battery loses its capacity to recharge entirely. Reduce screen brightness. The easiest way to conserve battery life while maintaining full function is to reduce the brightness of the screen. For devices such as mobile phones that have an organic light emitting diode (OLED) display, you can also use the “light on dark” option for viewing. Use Wi-Fi, not 4G. With Wi-Fi being up to 40% less power-hungry than 4G for internet browsing, turning off cellular data and using Wi-Fi instead will help your battery life. Use Airplane mode. This mode typically disables GSM, Wi-Fi, bluetooth and GPS functions on your devices. When turning off all such auxiliary functions, the device will use only up to 5% of its usual energy consumption with the screen off. For comparison, simply having your device in idle can still use more than 15%. Enhancing your phone’s battery usability requires a combination of limiting the use of power-hungry hardware and software, as well as handling mobile devices so as to maximise the charge capacity and minimise battery degradation. By adopting these simple strategies, users can extend their battery life by more than 40% in any given day while maintaining a more consistent battery capacity throughout the lifetime of the device. The link below is to an article that reports on the odd story of a man who answered his hot iron rather than his phone.